Day 7: Depart from the Gorilla Tracking Park, Drive to Lake Mburo National Park for zebras, Eland, Hippos, etc. Rise early for breakfast before a short drive to the Rwonyo Park Headquarters. This has often been a good chance of seeing hyenas coming back to their dens, hippos walking back to the water, you will see buffalo, zebra, impala and topi and with a bit of luck maybe even a sitatunga, an antelope rarely seen living in the papyrus swamps. After your early morning activities, return the lodge for a late breakfast on the wooden decking overlooking the water hole. Before lunch you can relax at the pool, the bar area or enjoy the privacy of your room. In the afternoon we bid farewell to the park’s friendly staff as we depart for Kampala. We drive through a magnificent hilly country and lush cultivation on an approximately four-hour journey. En route we will stop at the Equator for photographs and ‘polar-water experiment', then a local community popular for making local drums (Mpabire Village), gardens, crafts shops and fruit markets. 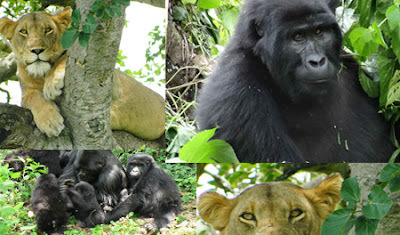 Included : All tour activities as indicated above – 1 gorilla permits per person, chimpanzee tracking permits, 6 nights accommodation (with breakfast, lunch and dinner included), sightseeing as noted in the trip itinerary, park fees, entry fees, ground transportation, a carton of bottled mineral water.